As far as uniquely-flavored and beautiful cakes go, this one literally takes the cake! 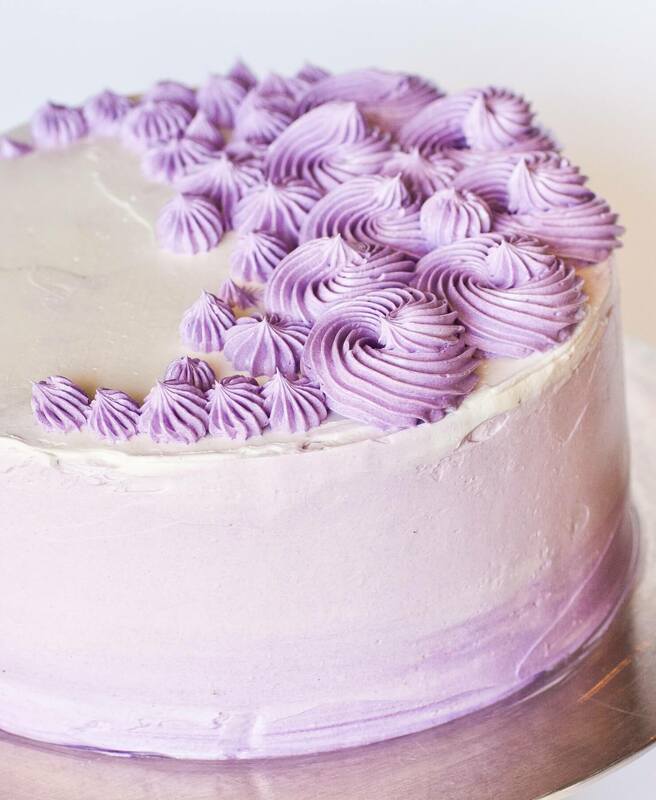 This lavender cake with peach preserves and meringue buttercream is somethin’ else! When peach and lavender come together, they create a sweet and aromatic symphony of flavors in your mouth! 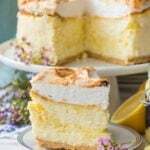 This cake is definitely one to try if you’re looking for something different, unique and delicious! 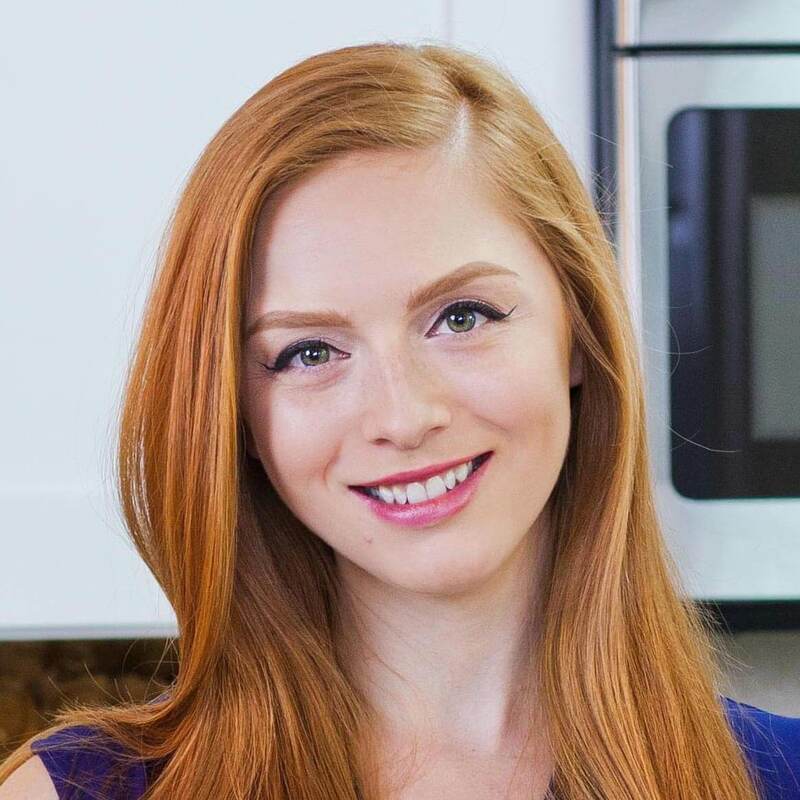 Watch my video recipe for the ombre frosting tutorial! 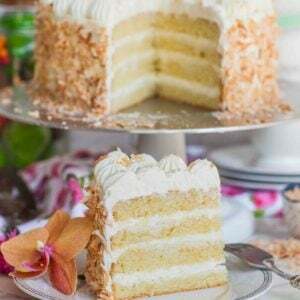 I created this cake recipe on a whim, exploring different flavor combination, which I love to do most! It was a total hit at family birthday party so I knew I had to share the recipe! 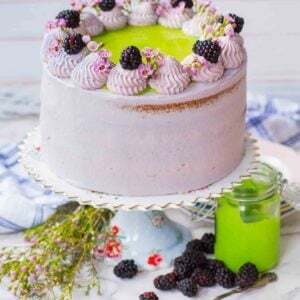 This beautiful lavender cake starts with lavender-infused cake batter colored a pretty purple color to enhance the eating experience. If you want, you can trim away the browned top and edges before frosting. Then, the layers are soaked with sweet, fruity peach preserves. And to make this cake even more interesting, I frosted the cake ombre-style! 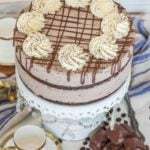 I used a Swiss meringue buttercream for this recipe but any type of buttercream will work well. 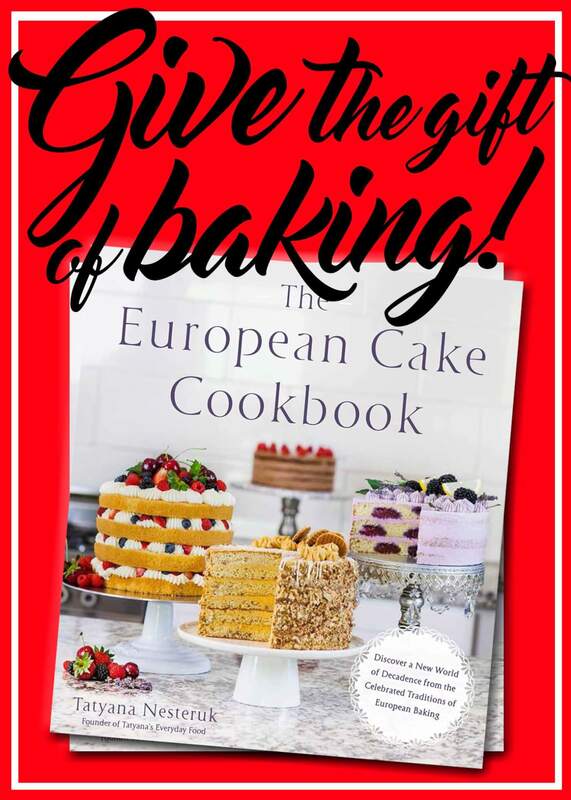 This particular recipe is especially great for frosting cakes since it holds its shape so well! If you’ve never tried this type of frosting, I highly recommend giving it a go! If you want to go with a standard buttercream, just add the flavor and color at the end! Preheat oven to 350F/176C. Line 3, 8-inch cake pans with parchment paper; set aside. In a large bowl, cream together the sugar and softened butter until light and fluffy. Add the eggs, vanilla and lavender and continue mixing until well combined. Pour in the milk and add a few drops of gel food coloring, if desired. In a separate bowl, combine the dry ingredients: flour, baking powder and salt. Using a fine mesh strainer/sifter, sift the dry ingredients into the cake batter. Whisk after each addition just until combined. Divide the prepared cake batter evenly between the prepared cake pans. Bake in preheated oven for 35 to 45 minutes, until the center is done and a toothpick inserted into the center comes out clean. Remove the cake layers out of the pans and place on to wire rack to cool completely. Prepare the buttercream. 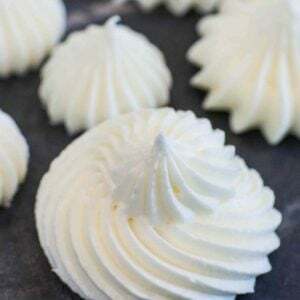 Place the egg whites in a stand mixer bowl and whisk on high speed just until soft peaks form. Meanwhile, prepare the sugar syrup. Place the sugar and water into a small saucepan and cook over medium heat until the syrup reaches 240F/115C. Once syrup has reached the proper temperature, turn stand mixer up to high speed and add the syrup in a slow stream into the egg whites. Continue whisking for 5 to 7 minutes until stiff and glossy peaks form. Begin adding the butter. Add a few tablespoons at at time and scrap sides of bowl often. Once all the butter is added, add the vanilla extract and continue whisking on high speed for 5 to 7 minutes until the buttercream comes together nicely. 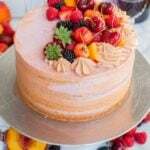 Assemble the cake: spread 1/4 cup peach preserves onto cake layer and top with frosting and repeat with second cake layer. Frost the outside of cake as desired. 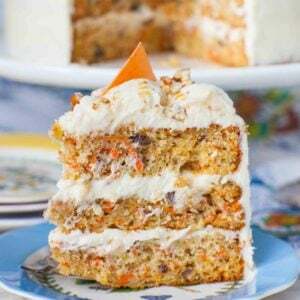 Keep cake covered and refrigerated; remove 1 hour prior to serving. For purple ombre frosting details, watch my video recipe on YouTube. This cake looks beautiful. I am sure it will be tasty and yummy too. 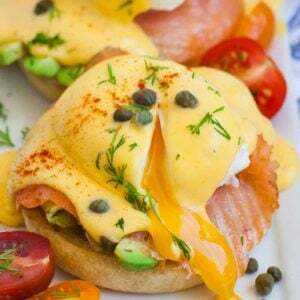 Will definitely try making it. But i want to know if theres any alternative to lavender oil. As its not available in india. I use a baking brand called “LorAnn Oils”. I think you should be able to find them online. If you find lavender oil at your local store, just make sure it’s safe for food consumption! Lavender extract will definitely work here, too. Since each extract has different concentrations, I honestly couldn’t tell you exactly how much to add, try 1/2 teaspoon at first! 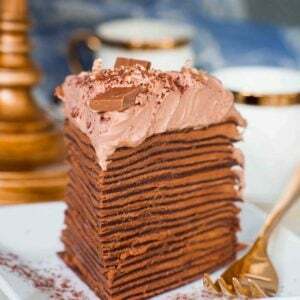 Tanya, Im nota big fan of buttercream is there anyway to make it with cheese cream? Hmm, sorry about that! I’m not sure why that would happen. Mine was very moist. Did you leave it refrigerated? That can sometimes dry the layers out if it’s left in the fridge for too long. I always keep my cakes covered in the fridge. I believe it would have been better with maybe 4 drops to give that hint of lavender. Thats just my opinion for the product I purchased. Oh, no! so sorry to hear that! Yes, there are definitely different strengths, I think maybe diluting it in water first and taste-testing might be the safest and least expensive way to test. Can you use lavender water instead of lavender oil? I have a big bottle of lavender water and don’t know what to do with it. Hi Tatyana. I’m sure you have gotten a lot of questions about the lavender in the recipe. My dilemma is I do not have access to extracts or oils but I do have dried edible lavender flowers. Please how to you suggest I substitute this with the oil the recipe required. Thank you. Ok. The batter is goid but very sparten. It made little fluffy layers that onmy required 15-20 min of cook time. Even with a 1/4 teaspoon it tasted a bit like my medicine cabinet. I may try this again, but will double the batter and use 1/8 teaspoon with more vanilla. That may give it some support background flavor with just a hint of lavender over top. Thanks for the recipe! I want to make this cake for a friend, but I don’t have 8″ pans… I have 9″ pans though… would you still use three pans, or perhaps downsize to two? Not sure what my best options is and want to see what you think. Thanks! Hi Parus! I actually have never used egg white powder. Please check the packaging, I’m sure they list a conversion on there – the amount of powder per egg white.